Tonight is the night of the Supermoon, a full moon at perigee that looks 14% bigger and 30% brighter than normal. 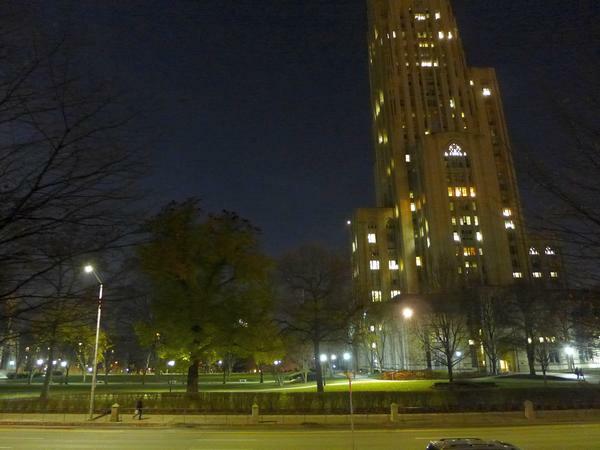 What will you see by moonlight on Pitt’s campus tonight, clustered at the treetops like large black leaves? 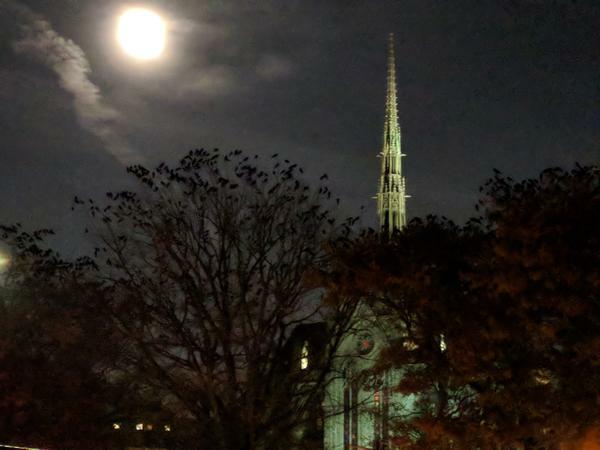 Despite the weird scarecrow sounds played from the buildings, Pittsburgh’s winter crow flock continues to roost in the mature trees surrounding the Cathedral of Learning and Heinz Chapel. On Friday I tried to count them by the light of the moon. They were clustered in 30 trees and on the roof of Carnegie Museum. The densest trees held 300 crows. Could there really be 9,000 crows in the area of Forbes, Fifth, Bellefield and Bigelow Avenues? Maybe I over counted. Last year I estimated 230 crows per tree making this total 6,900 crows on December 1 at 6:15pm. What is their fascination with the University of Pittsburgh? It isn’t the buildings. It isn’t the lawn. It’s the well lit trees. Crows prefer to roost where they can see danger coming. The campus is well lit for our protection. The crows like it, too. 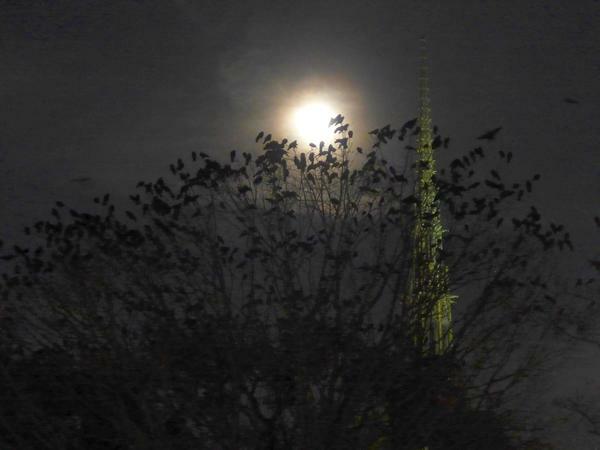 Alumni Hall is a good vantage point for watching crows and the moon rise next to Heinz Chapel. Stop by this evening to see it all by the light of the supermoon.